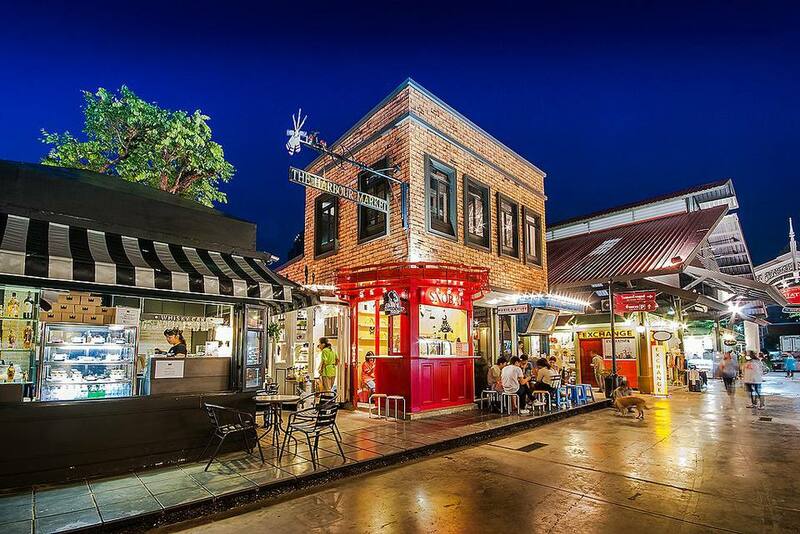 Asiatique, Bangkok's night market, has dozens and dozens of places to eat and if you’re coming for dinner, plan ahead a little so you’re not paralyzed by all the options! The dining choices are roughly broken into three categories: street food/food court style carts in the center of Asiatique, higher-end, sit down restaurants, and mid-range mostly local chain restaurants. Asiatique’s main food court is towards the back of the complex. It’s all outdoor and you will find some classic Thai dishes, some popular Thai street food dishes, plus other cuisines including Japanese and Chinese. There’s plenty of Thai beer, too, thanks to the fact that the family that developed Asiatique also happens to own Chang beer! If you just want a quick plate of som tam or pad Thai and a cold brew while you take a break from shopping and looking around, this is your fastest and cheapest bet. Flann O’Brien’s Irish Pub - Want to sip a Guinness next to the Chao Phraya? Head to this full-service Irish pub for lamb stew, burgers, fried fish, fisherman’s pie and other typical pub grub. The large restaurant feels pretty authentic, down to the live football games being shown on the screens around the bar. Though Thai food is probably your first choice while visiting, those in need of a little Western fare will be very happy here. Kacha Kacha, a bustling teppanyaki has a good selection of the usual fare: yakitori, okonomiyaki. Décor is felt almost a little too authentic (maybe more like a theme-park than a well-worn teppanyaki in Japan) but judging from the fact that it’s packed they must be doing something right. If it’s not too not, you can eat upstairs on the outdoor roof terrace, which is decorated with pretty paper lanterns. Kodang Talay is one of the few nicer Thai restaurants at Asiatique. The theme, seafood, works perfectly given the location, and in fact, the location is perfect as it’s right on the waterfront. The restaurant serves up classic Thai seafood dishes, including braised whole fish, tom yum gung, and fried fish cakes. There are also lots of non-fish dishes, including stir-fried vegetables and omelets and noodles. Capri, which has a prime location just across from the ferry boat landing, serves mostly Italian dishes including pretty decent thin crust pizza and some nice pasta. This restaurant is a bit overpriced and service feels rushed, but that’s all really a function of the popular location. Don’t want an expensive meal but not interested in the food court? In the front (street side) of Asiatique are about half a dozen local chain restaurants. The food will definitely taste like chain food, but these restaurants tend to attract many more locals so they’re actually more interesting places to eat than the tourist-dominated options.